The ultrasonic IRIS is one of the most accurate, up-to-date, and reliable technologies for the inspection of heat exchanger and boiler tubes in use today. IRIS inspection is an ultrasonic immersion pulse-echo technique. It uses an ultrasonic transducer that is contained in a test head and is self-centered within the tube being examined. Ultrasonic pulses are emitted along a path parallel to the tube axis. The pulses are then reflected by a rotating mirror at a 450? angle and directed radially onto the tube wall. As the mirror rotates, the ultrasonic beam traverses around the tube circumference, and each successive pulse is mapped out on the screen of IRIS. There are nearly 200 readings per revolution and over 2300 revolutions per minute. Unlike eddy current inspections, the data provided does not require special interpretation or guesswork, and a report can be supplied immediately following the inspection. There is also increased reliability with IRIS because the ultrasonic technique is quantitative. It can distinguish between external and internal conditions and is not affected by the construction of the bundle (i.e., stiffeners, baffles, tube sheet, and supports). 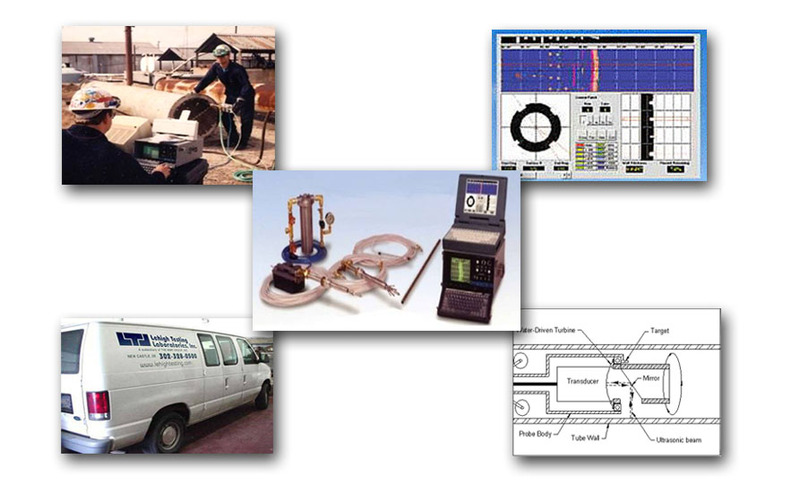 Lehigh Testing Laboratories, Inc. (LTL) has the necessary experience and certified inspectors to provide complete mechanical integrity inspection programs. From development to implementation to ongoing program maintenance, we assist you throughout the entire inspection process.